If your complete NCBA team is not interested in participating in the 2018 showcase, but you still want to sharpen your skills before the conference season, you can travel to Plant City to compete as a "Free Agent" on the Rawlings Free Agent Team. 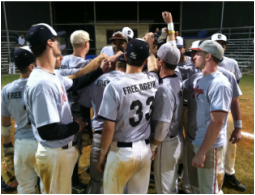 The NCBA free agent team is made up of players from across the country, alumni of the league, and an NCBA staff member that serves as the coach. The team is created each week of the event on a participation basis. (This means that unless there are enough interested players to fill a competitive roster during a given week, the team will not be formed.) This also means that interested players should fill out the form below ASAP to be sure that a team is formed during your week of Spring Break. Players pay a one-time registration fee of $50 that includes a minimum of four games, one practice and a Free Agent team t-shirt. Please complete and submit the following form if you are interested in joining the free agent team.